The Ware Auditorium on the corner of Washington and Fourth Streets has been a hub of the Northfield entertainment scene for more than a century. Now known as the Grand Event Center, it was built in 1899 by A.K. Ware. Northfield’s first permanent opera house was an unassuming hall above Lockwood’s shoe store on Division Street. When Ware announced his intent in 1899 to build a grander facility, public response was so favorable that he scrapped his original plans in favor of an even more elaborate building. It cost more than $20,000. Designed by Minneapolis architect Harry Carter, the red brick auditorium was built in the Federal Revival Style. 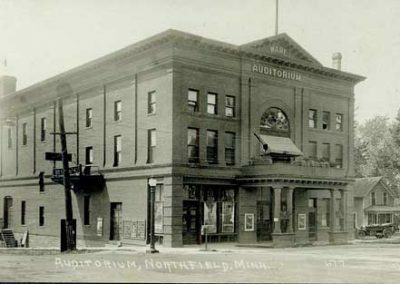 The auditorium could seat nearly 800 people; it had orchestra seating on the floor, a balcony with gallery seating behind it, two first-floor proscenium boxes, and two balcony boxes. The auditorium opened the day after Christmas in 1899. A traveling troupe presented The Red Cockade, a romantic comedy set during the French Revolution. People from Minneapolis and St. Paul came by train for the show. Four months after it opened, the building was gutted by fire and quickly rebuilt. In 1910, Ware put the building up for sale. When no buyers came forward, he closed the auditorium and moved out of town. 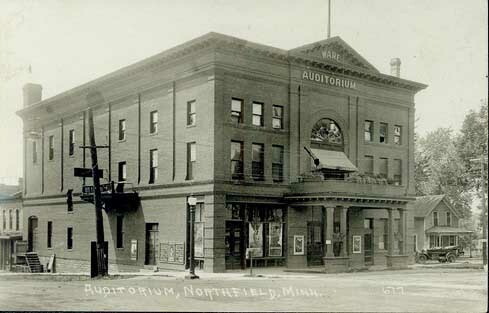 A group of Northfield citizens purchased it in 1912, and it served a final stint as an opera house until Everett Dilley bought it in 1917. He reopened it as the Grand Theater, a place where Northfielders could watch silent films accompanied by a five-piece orchestra. The Grand was the largest and most elaborate of several silent movie theaters in Northfield during this time. Dilley sold the theater in 1927, and the new owners moved the entrance to Fourth Street and added an electric sign. Two years later, they installed the equipment needed to show talkies. In August of 1929, Leo—the lion who roared at the beginning of MGM’s films—visited the theater. Dilley repurchased the Grand in 1933 and sold it after World War II to Ervin D. “Dinger” Olsen, a St. Olaf graduate, who updated the theater screen and projectors. The theater changed hands several times in the 1960s, 70s, and 80s. In 1985, owner Tom Doughty shuttered the Grand when he built a three-screen theater on Highway 3 in Northfield. The building got a new lease on life in 1997 and now hosts receptions, parties, concerts, and community meetings. The Ware Auditorium in about 1900.